The software industry is facing a talent shortage and finding quality candidates for important positions like sales and customer success is harder than ever. Berke has 15 years of experience helping growing companies hire great people. Over that time, we developed an understanding of the qualities that influence success in a given role. We can help you identify the candidates that will become great employees. A high performing sales team is critical to your company’s growth. You want sales executives who will hustle, maintain a good attitude, and hit their quota each and every month. 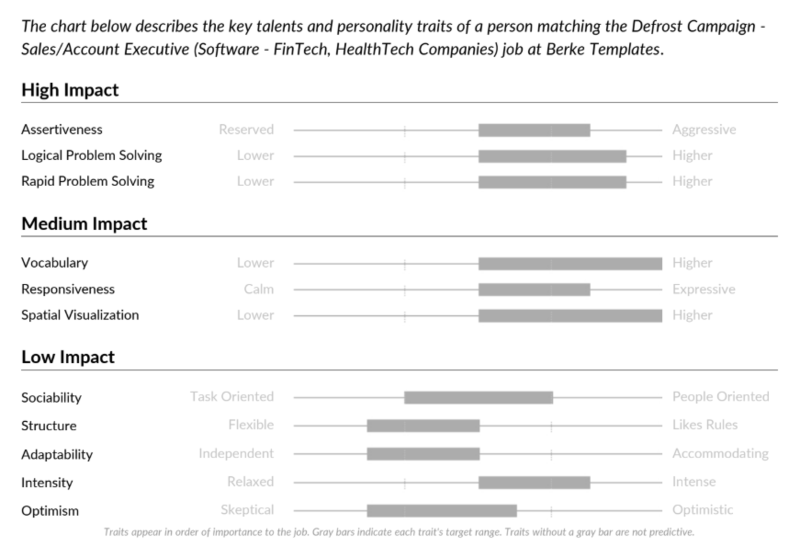 Berke hiring profiles define low, medium, and high impact traits as they relate to a specific job. 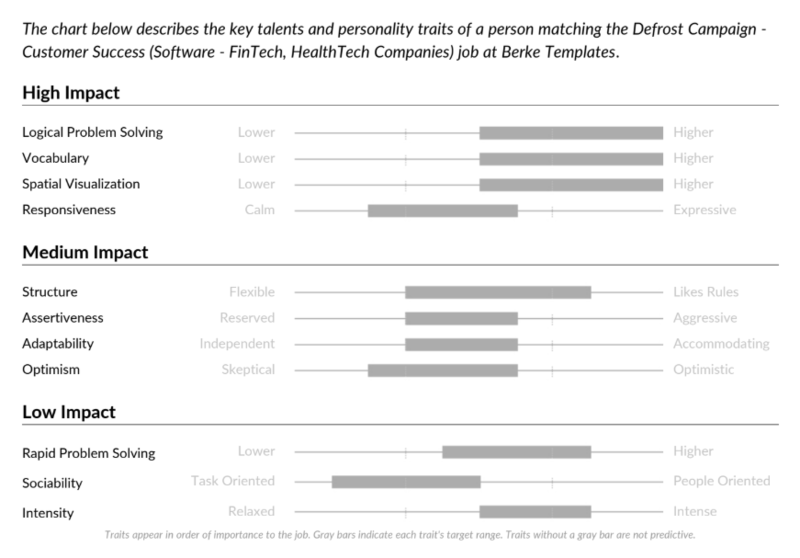 The high impact traits contribute the most to success on the job. For a sales job assertiveness, logical problem solving, and rapid problem solving are high impact traits. Information about why those traits, in particular, are so important is below. People in this range are assertive and results-driven individuals who enjoy taking action. They are decisive and competitive, and they prefer a direct approach to getting things done. People in this range have a good ability to solve complex problems logically. They are able to pull difficult issues apart to deal with the components one by one. They like being able to think through a problem or solution in order to present it carefully and logically to others. People in this range can solve problems in rapid succession using a quick, intuitive approach. They like to have new issues to deal with every day. They can typically handle smaller issues quickly and move on to the next one without pausing. Customer success ensures that your customers are happy, value your product, and ultimately expand their usage. For a customer success role, logical problem solving, vocabulary, spatial visualization, and responsiveness are all high impact traits. Information about why those traits, in particular, are so important is below. People in this range have a very strong ability to develop logical solutions to complex problems. They are adept at using a linear, step-by-step approach to break larger problems down into smaller components. They are generally able to explain their solutions carefully and clearly to others. People in this range learn easily and quickly from their environments. They pick up new information readily and learn rapidly when circumstances change. They typically make use a wide range of acquired experience and knowledge in making decisions, deciding on a course of action or adjusting to a changed environment as needed. People in this range are able to think about and visualize complex systems. They are able to deal with problems in which there are multiple variables that are constantly changing. They can mentally manipulate variables in complex models to understand what will happen when something changes. People in this range maintain a useful degree of responsiveness and time sensitivity while avoiding impulsive or rash reactions. They are motivated to meet deadlines and organizational standards while keeping activities running smoothly and projects under control. If you would like to learn more about how Berke helps software companies know who to hire, book a demo. We're all about consumer reviews. Get the real inside story from industry operators like you.